Recycling is everyone’s responsibility. Whatever your profession is, status in life, or age group, recycling is a shared responsibility that everyone has to take part in to take care of the world we live in. However, not everyone knows what recycling really means and most do not know where to start the practice of recycling. To explain in the simplest of terms, recycling is basically converting your waste or garbage into a reusable material to prevent, well, more waste. Recycling helps us reduce the waste we produce in our everyday lives when we buy our foods from grocery shops or personal items and other stuff from department stores. To make recycling an effective way of reducing waste, every person in your household should be practicing it, from the parents to the kids, recycling should be a way of life in every household to ensure effectiveness and efficiency. It could a bit of challenge though to educate your kids the idea of recycling and teach them ways as to how to recycle some things. A good idea is to communicate to them the idea and ways of recycling through fun and exciting activities and games to ensure that they will enjoy the practice of recycling some of their wastes into reusable, functional materials. 1. First off, to educate your kids on the basics and importance of recycling, you can prepare a video, or look for something on the Internet, that teaches the value of this practice. The video should be fun, easy to understand, simple, practical, and informative. You should not have a hard time finding one to show the kids because there are plenty of videos on the internet intended for kids to help them understand the idea of recycling. Aside from videos, you can do a mini book or catalogue that teaches the basic principles of recycling. Make sure that you include mini games in this book like simple mazes and crosswords so it is more enjoyable for the kids to do and learn from. By doing this first, you are helping them understand the significance of recycling and reducing waste in their lives. 2. After educating the kids about recycling, you can jump into recycling activities. Doing arts and crafts is one way of teaching the kids how to recycle some of the materials they use every day that could turn into waste when not recycled. You can perhaps teach them how to recycling some plastic or glass bottles that they have just used. After cleaning the bottles thoroughly, they can do their own paintings on the bottles and use it again as a vase or storage after the paint has dried. Another idea is to recycle some of your milk cartons at home. Empty milk cartons can be recycled as a birdhouse. All it takes are some paints, glue, and a pair of scissors to make this recycled birdhouse a reality! 3. 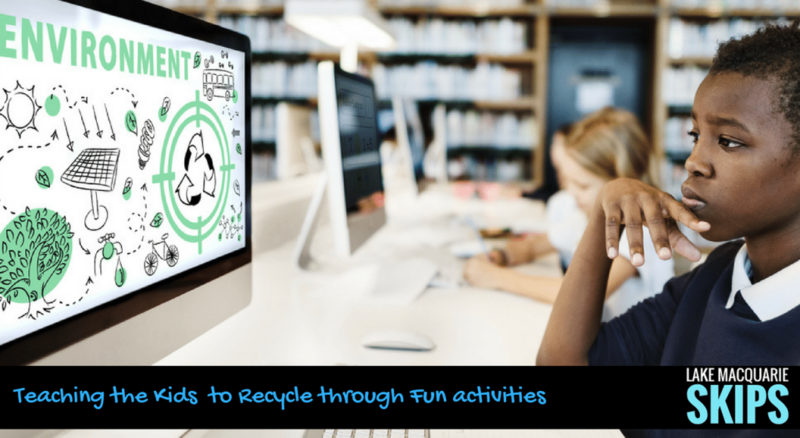 At home, or in a classroom setup, you can play some games with the kids using recycled materials such as used tin cans, plastic bottles, old newspapers, etc. Instead of buying new ones to play with, using old materials will show and teach the kids how used items can still be reused in a fun and enjoyable way. Play newspaper relay or newspaper dance, trash can relay, tumbling towers, or bottle bowling. Winners can get a small prize for their hard work. You can even incorporate some trivia about recycling every now and them so that this activity is both fun and educational. 4. Lastly, instead of buying new art materials, you can teach your kids how to make new papers from paper scraps and new crayons from their old, used ones. Instead of spending money to buy them new art materials, teach your kids to make new paper sheets. All they need are some paper scraps, water, blender, a bowl, and a dishcloth. Basically, they just have to make a paper pulp from the paper scraps by adding water and pressing them against a dishcloth for drying. A blender is advisable to make sure that the pulp is finely mixed. Note that your supervision is needed for your kids’ safety! On the other hand, melting old crayon leavings to make a new one is a good idea for recycling as well. Let the kids decide which colours to mix to create a new colour for their usage while you, the adult, take care of the melting part. After melting, you can pop in the refrigerator for a few hours and once they harden, the kids can use them already for colouring! These are just some activities and projects that you can do with your kids to teach them some ways of recycling some of their rubbish. Remember that the activities should be fun, as well as educational, so that your kids will be engaged in the activity all the time. It is important to start teaching kids the importance of recycling so that this will be a practice that they can start doing from an early age and as they grow up. When every person in your household learns the value of recycling, and practice it, the world we live in will be healthier and cleaner, for the present day and for the future generations to come!